After the cracking performances in the first two games of the season, it was a happy band who met at the West Herts prior to this match. Those who had been at Bournemouth were assuring those who hadn’t that the game had been as much fun as it sounded on the radio and in reports. We also took time to teach them the new chant for Doucouré. Team news was that Silva had made six changes from the Bournemouth game, giving Deeney and Hughes their first starts of the season. 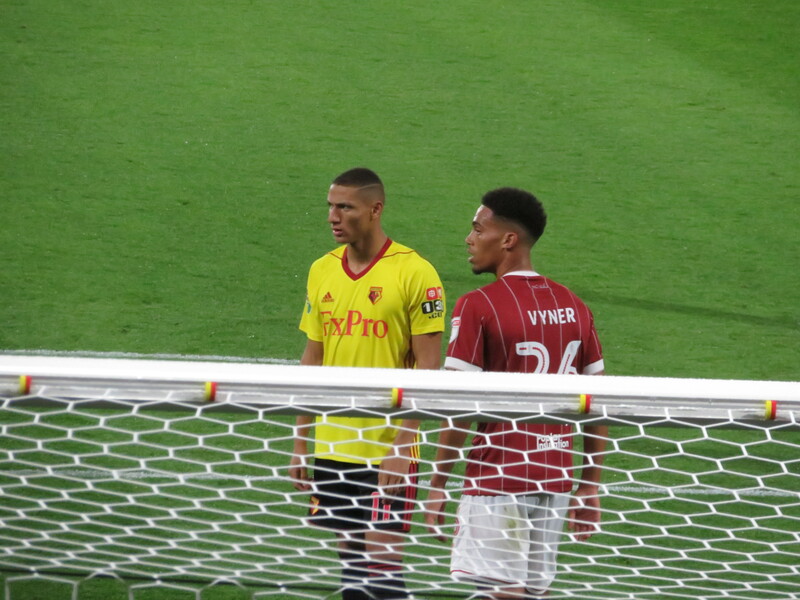 Despite the changes, it was a very strong team with a starting XI of Gomes; Mariappa, Prödl, Kabasele, Holebas; Watson, Capoue; Amrabat, Hughes, Richarlison; Deeney. As we approached the ground, there were long queues for the ticket office and many of the seats around us were empty at kick-off, although they soon filled up with unfamiliar, but eager, faces. The game kicked off and the style of football transported us back to last season. The first time that I felt inspired to make a note of the action was in the 26th minute when Deeney directed a header just wide of the target. Deeney also had the next chance as he latched onto a ball into the box, but Flint made a saving tackle to prevent the shot. The first goal chance for the visitors came following a corner but O’Dowda’s shot was straight at Gomes. The Hornets had a half chance to open the scoring just before the break as Richarlison turned and shot from outside the area, but his effort was well over the bar. The half time guest was Keith Millen who revealed that, even though he worked at Palace at the time, he thought that Harry Hornet’s dive in front of Zaha was very funny. Silva made a substitution at the start of the second half bringing Success on for Amrabat. The home side took the lead in the second minute of the half, before a large proportion of the crowd had returned from their visits to the concession stands. Hughes played a one-two with Success before finding Capoue on the left from where he fired past Fielding in the City goal. I relaxed at this point thinking that we would go on and win the game. Honestly, what was I thinking? I have been to enough of these games not to be so complacent. 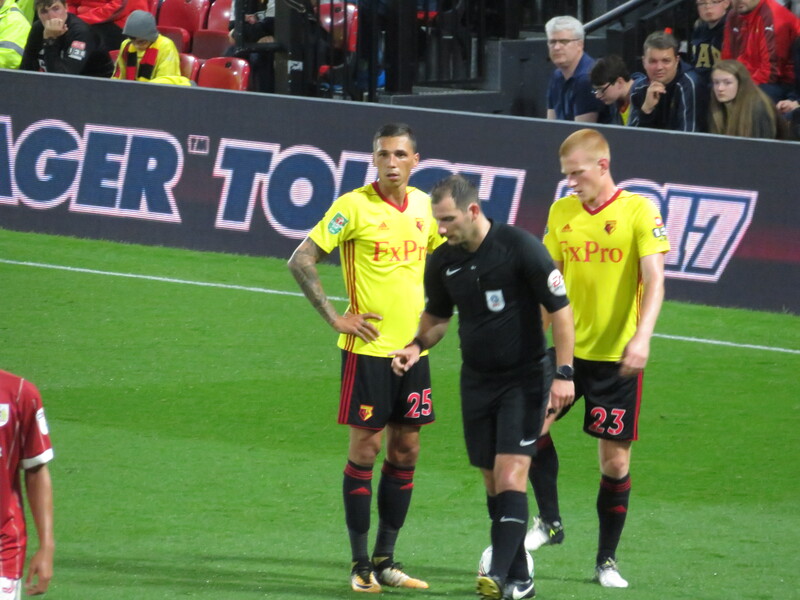 The next action of note was Holebas receiving his first yellow card of the season for a foul on Eliasson. 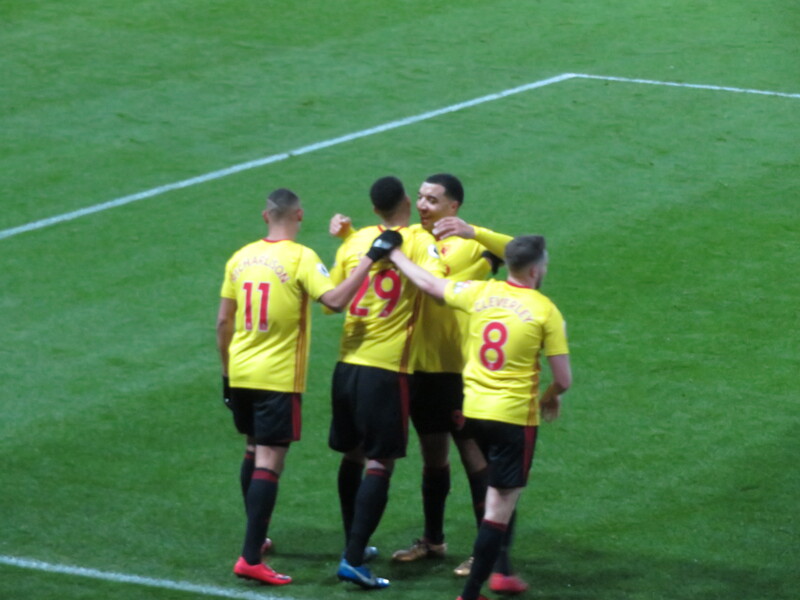 On a more positive note, Capoue whipped in a lovely cross, but Deeney was unable to connect and the ball found its way to Success whose shot was straight at the keeper. At the other end, a corner from Eliasson was met by the head of Flint, but the effort was blocked for a corner. 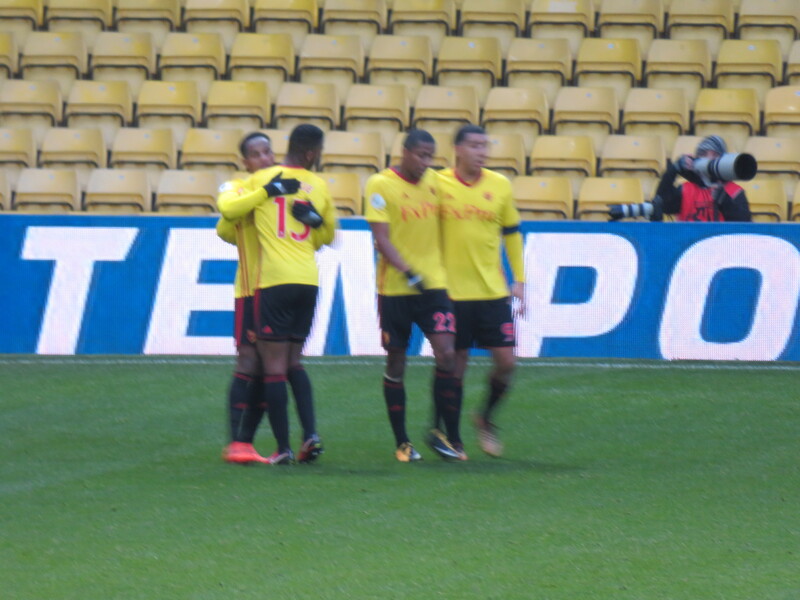 Watford looked to increase the lead with a low cross from Success into the box, but Deeney was unable to connect. On the hour mark, City equalized, as Hinds went on a run and hit a lovely shot from distance that found the bottom corner at the near post. It was a chance out of nothing, but it was very well taken. Watford’s first attempt to strike back came from Capoue who tried a shot from just outside the centre circle that was just wide of the target. But, somehow, Watford managed to turn attack into defence again, as City launched another counter-attack, the cross from Kelly flew past a number of Watford defenders before reaching Reid who tucked it past Gomes to put the visitors into the lead. Watford attempted to strike back as Richarlison met a cross from Success, but his header back came off the outside of the post. Silva increased his striking options, bringing Gray on for Hughes. City had a chance to increase their lead, but the shot from O’Dowda was straight at Gomes. 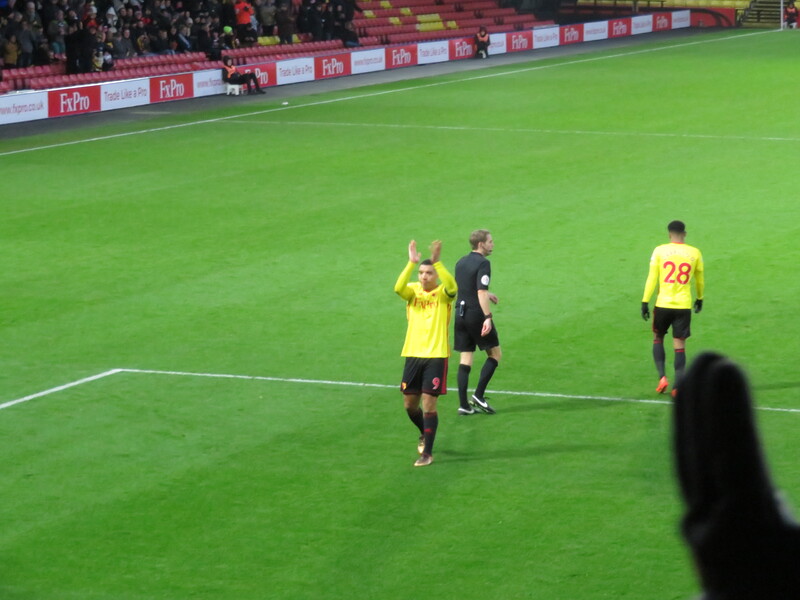 There was then a lovely passage of play from the Hornets as Gray exchanged passes with Deeney before trying a shot that was tipped wide by Fielding. Silva made another change bringing Cleverley on for Capoue. 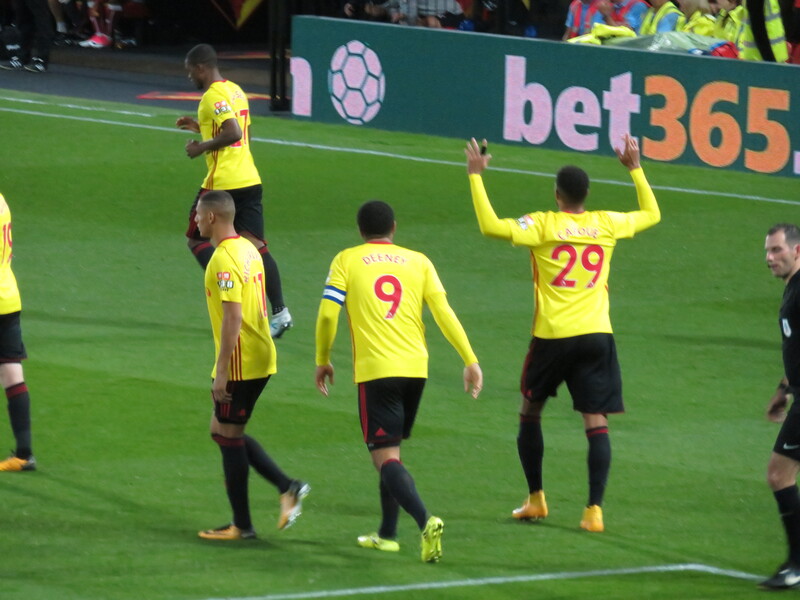 Watford continued to go for the equalizer as Richarlison met a cross from Success with a header that flew high and wide. 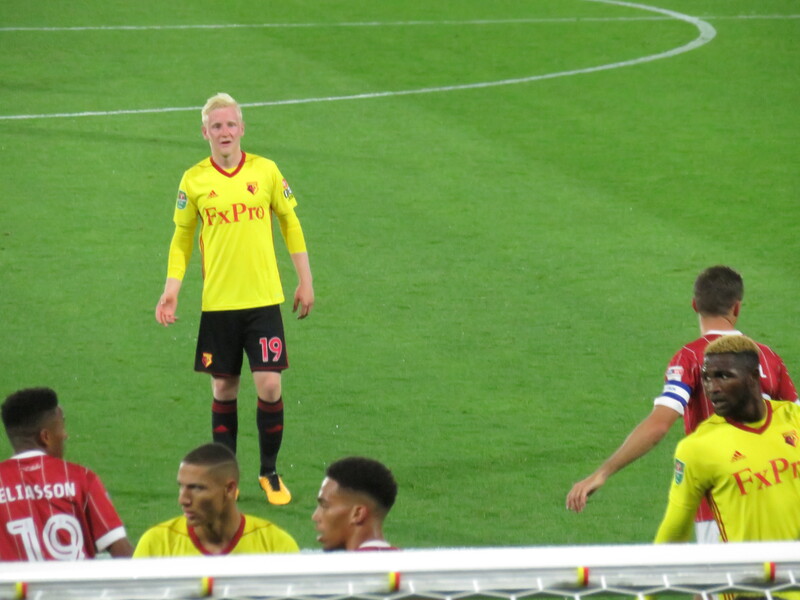 But things went from bad to worse for the Hornets in the final minutes as Holebas was shown a second yellow for a foul to stop a breakaway after an air kick caused him to lose possession. The visitors had a decent chance of a third in the final minute of normal time, but Gomes pulled off a lovely save to stop O’Dowda. Sadly, the visitors weren’t to be denied as Eliasson received the ball in space and beat Gomes to put the tie out of Watford’s reach. There was time to pull a goal back in the last minute of time added on as Mariappa headed home, but it was City who went into the early morning draw in Beijing on Thursday. 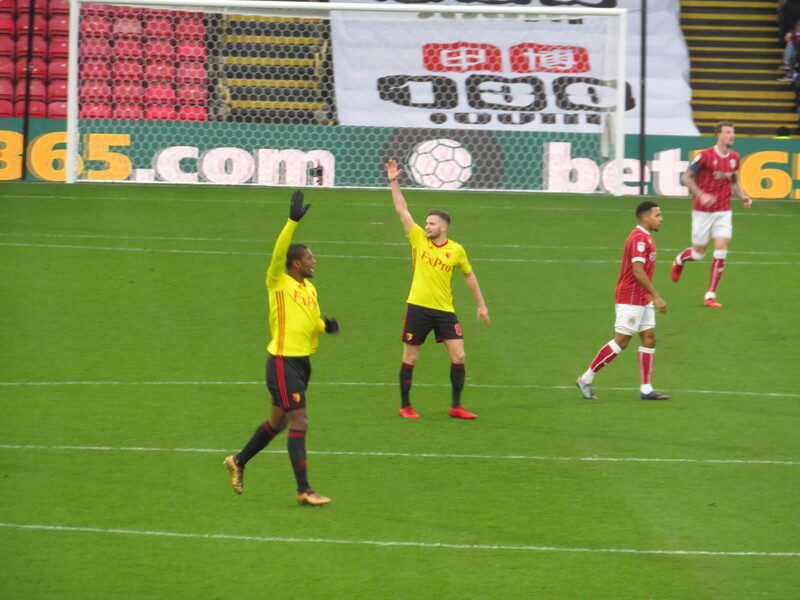 The players trudged off the pitch at the end, with only Deeney and Gomes making much of an effort to acknowledge the crowd. Tim Coombs went for the ironic approach as we left the ground to “That’s Entertainment” playing over the tannoy. On the way back up Occupation Road, I spotted Olly Wicken being interviewed for From The Rookery End. Tonight’s was a game that definitely won’t be featured in Hornet Heaven. Nobody had the stomach for a post-match review, so I was alone with my thoughts. It was a strangely lack lustre performance which lacked the energy demonstrated in our league games this season. Maybe worse than the result was losing Holebas for the next game after two silly tackles, a real blow as we lack cover in that position. These terrible League Cup defeats have been a regular occurrence in recent seasons, which is a great shame as it is an opportunity to entertain and impress some fans (like the young boy in the row in front of us) who do not attend games regularly. Still, if we beat Brighton on Saturday it will be forgotten until next August when, no doubt, we will all subject ourselves to the punishment again. This entry was posted in Watford FC and tagged Aden Flint, Adrian Mariappa, Andre Gray, Ben Watson, Bobby Reid, Bristol City FC, Callum O'Dowda, Christian Kabasele, Etienne Capoue, Famara Diedhiou, Frank Fielding, Freddie Hinds, Gary O'Neil, Heurelho Gomes, Hordur Magnusson, Isaac Success, Jens Hegeler, Jose Holebas, Korey Smith, Lee Johnson, Lloyd Kelly, Marco Silva, Matty Taylor, Niclas Eliasson, Nordin Amrabat, Richarlison, Sebastian Prodl, Tom Cleverley, Troy Deeney, Watford FC, Will Hughes, Zak Vyner on August 25, 2017 by franelynn.